Pittsburgh City Paper has been connecting businesses to the real people, scenes and neighborhoods that make Pittsburgh such a unique place for the past 26 years. As Pittsburgh's independent voice, we offer a unique prospective on local politics and news, intelligent and fresh cultural reporting, the most comprehensive calendar of events, and stories you will not find anywhere else. Our readers are younger and more affluent, entering the acquisition phase of life, a great demo for advertisers. In addition to our weekly print edition, we offer authoritative editorial guides and special issues, dynamic web and mobile sites, and our recently introduced mobile app. 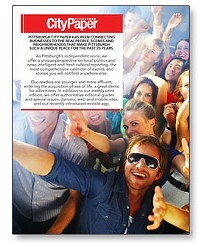 Contact us for ad rates or navigate the Media Kit PDF to review all of the advertising opportunities that City Paper has to offer.